Did you know… the Assessor does not levy (assess) a tax? It is the Assessor’s duty to determine the market value of all property within the Township.Separate market values are required for land and building portions of the real estate. After determining the total value of the real estate, the property is assessed at one-third (33.33% of its appraised value). Assessing property at a pre-determined percentage of market value is called an assessment system. Illinois is not the only state that uses such a system. The Assessor values all property as of January 1 of the tax year. Reassessments are mandated by statute every four years. This is known as the general assessment year. The property tax code requires the Chief County Assessment Office and the Illinois Department of Revenue to apply equalizing factors each year to maintain the 33.33% level of assessment on all properties. PRINCIPLES THE ASSESSOR’S OFFICE FOLLOWS. 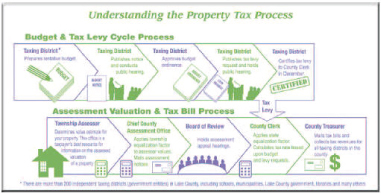 The Township assessors use the same principles, techniques and methodologies as those employed by fee appraisers with only slight variations to accommodate the uniformity criteria of the United States Constitution and the Illinois Constitution. THE ULTIMATE PURPOSE OF ASSESSED VALUE IS TO APPORTION THE TAX BURDEN. The Assessor is not responsible for deciding the tax burden. That is established by the major taxing bodies. The role of the assessment is to provide a means to divide the tax burden in a fair and equitable manner based on the value of the real estate. THREE APPROACHES TO VALUATION. The Assessor uses three traditional approaches to appraise property: the cost approach; the market or sales comparison approach; and the income approach. These are standard methodologies in the appraisal industry. Variations in the application of these approaches are necessary because the Assessor is also required to ensure that similar properties have similar assessments. This is known as assessment uniformity. STATISTICAL TESTING AND ASSESSMENT ANALYSIS ARE INTEGRAL PARTS. As a result, assessors rely on statistical measures much more than fee appraisers. Armed with means, medians and coefficients of dispersion, the Assessor is able to confidently appraise properties at the appropriate percentage of market value and ensure the degree of uniformity in the Township is within acceptable parameters. THE PERSONAL TOUCH MATTERS. If you call the West Deerfield Township Assessor’s office, you’re likely to get Tom, himself, on the phone. It’s part of his office’s commitment to serve the community by being approachable. Tom remembers the days when Deerfield really was “fields” and believes that being neighborly is the only way to be. It’s a point of pride with him that his office walks people through the process and that even if someone comes in angry that generally there’s a handshake when they walk out. EXEMPTIONS THAT CAN REDUCE YOUR PROPERTY TAX BILL. Contact our offices with questions, applications and required documentation to take advantage of all the exemptions that are available to you. is a $6,000 reduction in the assessed value of your property, if that property is your primary residence on or before January 1 of that tax year. is a $5,000 reduction in the assessed value of your property the tax year you turn 65 years of age on your primary residence. For available Senior Exemption Forms, click here. This exemption freezes the assessment on your property if the total household income is $65,000 or less. This is an exemption that must be renewed each year. For available Senior Exemption Forms, click here. is a state loan with a simple interest of 6%. Repayment of this loan is due upon death or sale of house. To qualify, one must be 65 years of age as of June 1st of the tax year, have a household income under $65,000, must have proof of insurance, property taxes must be current, and the property must be your primary residence. Call the Lake County Treasurer for more information at 847-377-2323.
is a $2,000 reduction on the assessed value of the primary residence. For available Disabled and Veteran’s Exemptions, click here. Exemptions are also available. For available Disabled and Veteran’s Exemptions, click here. This factor was determined by the Illinois Department of Revenue in a three-year sales ratio study analysis using arms’ length sales that have occurred in 2015, 2016 and 2017 and compares them to the prior year’s assessment values. The sales ratio study is done by the Illinois Department of Revenue for every county and township in the State of Illinois annually. The most recent data from the Department of Revenue has determined that the 2018 assessments in West Deerfield Township must be increased by .0032 over the 2017 assessment levels because the market sales over the last three years are now higher than the assessment value levels in place. The 2018 equalization factor of 1.0032 should not be construed as an “annual real estate market increase” that would be determined via realtors. If recent sales in your subdivision and neighborhood indicate that your parcel is overvalued after the application of the 2018 equalization factor then that is a basis for an assessment appeal. You may also choose to appeal, if your assessed property value is high compared to other similar properties in your subdivision or neighborhood. Property owners are not able to appeal an assessment value solely based on the 1.0032 equalization factor. One other thing to remember is that all assessments in West Deerfield Township will receive the 2018 equalization factor of 1.0032, your share of the property tax burden in West Deerfield Township will remain relatively the same and will not adversely increase your property taxes.